Since I’ve been unable to make it into the studio this week I’ve decided to teach you a very important lesson instead. In fact, it’s probably THE most important lesson of all. No matter what level of drumming you are at or where you want to take your playing THIS is where it’s at my friend. 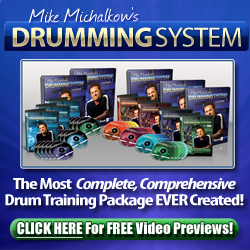 Your job as a drummer is to keep the time in check and to make the music feel good. That’s it. The number one goal. It doesn’t matter if you are playing solo, with a trio or a full band. You need to groove and you need to groove well. Everything else is supplementary to this core function. If you look at all the great drummers who are always in demand you’ll notice they can all groove like a demon. Steve Gadd, John ‘Jr’ Robinson, Gerald Heyward, Ralph Humphrey, Russ Miller. Even the guys who are known for their chops, the ones in work, are the ones who can lay it down. So why is it that so many drummers spend the majority of their practice time on chops? Who knows, maybe it’s ego, but it’s obvious when you see them play. They can tear round the kit like nobody’s business but when it’s time to play some music, they just can’t do it very well. And that’s why their phones never ring. The simplest way to master any drum groove is to make an itunes playlist of at least 10 songs featuring that particular groove. The songs should cover the full range of tempo’s, dynamics and musical styles. Transcribe or chart the tunes and create a little workout routine that you can drill over and over again. That way you can really delve deep into it, learn all the little nuances that make it work and develop the proper feel. Playing the same pattern over and over again will help you to commit it to muscle memory and you will also internalize some of the other musical elements of each song (note placement, spacing, subdivisions, structure, melody and harmony) that really make it swing. Below I’ve written out a sample playlist for each of the seven most frequently performed grooves. You really need to nail these down if you want to play on a regular basis. Try to include tracks from Rock, Blues, Funk, Country, R&B and Reggae so you can avoid the one trick pony syndrome and learn how to jam in any style with any band. All I want you to do is take one morning out of your life and make up these playlists. It’s not a big investment of time or effort but it will pay massive dividends in the way you practice and in the way you play. If you spend an hour a day drilling out these tunes I promise you that you will notice the difference. It’s a very simple process here, you do the work and your groove gets better. Nice! When you have these down and I mean really have these down then you can start to explore other grooves and feels using the same technique. Out of all the students I’ve ever had, the ones who did this and stuck with it made the most progress by far.